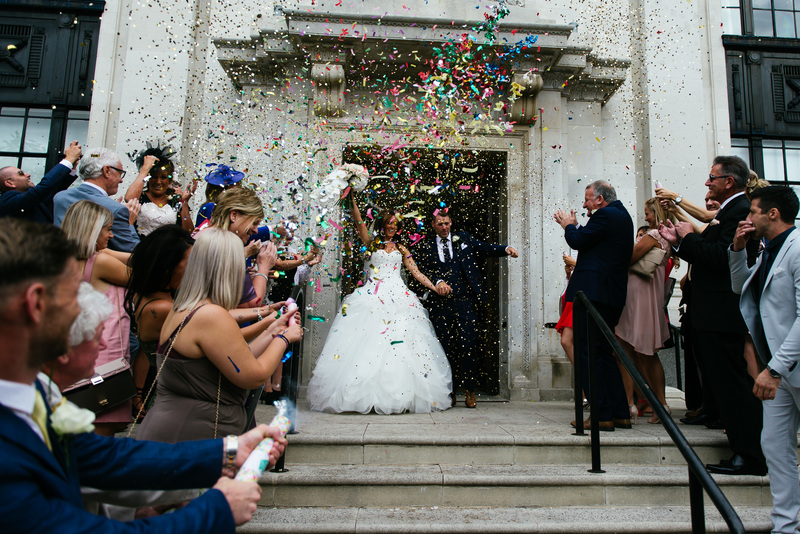 With photographs filled with laughter, beaming faces and enough dancing to require a full weekend spent on the sofa – there’s no doubting this wedding was filled with more fun and personality than you could shake a neon glow stick at! With both Carly and David loving Ibiza and it being the place that David popped the question, they felt it was only right to infuse their wedding day with a real Ibiza party vibe. By decking out their wedding with metallic confetti cannons outside the town hall, logo-ed fluorescent wedding glasses as favours, glow sticks, a fancy dress and prop box on the dancefloor and an amazing saxophonoist covering classic Ibiza tunes they managed to bring a slice of Ibiza to London town. Carly and David chose to begin their day in the gorgeous Islington Town Hall and despite being in a traffic jam for an hour amidst an anti-Brexit march (which wedding guests actually found quite amusing!) they finally made their way into the iconic Borough Market for their reception in the stunning Roast Restaurant. First things first, we want to know a bit about you two – how did you meet? Dave and I met at SW4 festival in Clapham Common, London back in August 2010 but we ended up having our first official date three years later! We went on a cocktail safari around Central London, where we managed to pack in fifteen cocktail bars into one all day and night session! We had so much fun and there was an instant spark between us, we didn’t stop laughing and chatting all day. From that weekend onwards we have been pretty inseparable since! How did Dave pop the question? Dave proposed to me mid September in 2015 at the Blue Malin Beach Club in Ibiza. At the end of a jetty into the sea at sunset, he got down on one knee and pulled out my gorgeous ring. I said yes immediately! Then we spent the rest of the night partying away at the Beach Club, it was an amazing, beautiful day! It was perfect timing as we had another week left of our holiday in Ibiza to continue the celebrations. How did you find the planning process? Did you organise a lot of it yourselves? I am a natural born organiser and love arranging nights out with friends, hen do’s, holiday, hosting parties at home – everything and anything! So arranging my own wedding was just a dream come true! To organise the biggest and best day of my life with a great big party to follow – I was in my element! Picking the reception venue was probably the easiest as we had our hearts set on the space, layout, design and vibe plus the amazing food and drinks ticked all our boxes. The trickiest part of the organising were the logistics really - with the multiple venues, travelling from place to place, getting items to the individual venues and getting all the hotels booked for before and over the wedding weekend. The really important aspect of the day for us was having a really fun party, with lots of laughter, love and dancing. We didn't want it to feel too formal or traditional - we wanted something that felt like us and I think we achieved that. We wanted our wedding to stand out in terms of the fun factor! The guests play a huge factor in making a wedding and we always knew with our families and crazy friends (on both sides!) it was a recipe for success. As an owner of a wedding dress shop yourself, how was it finding the right wedding dress? I've tried on hundreds over the past few years due to owning a pre-owned and ex-sample designer Bridal Boutique, but once I got engaged we visited about a dozen bridal shops in Kent, London and Surrey. I knew I would get my dress from my shop, but I still wanted that fun wedding dress shopping experience! Plus visiting all the shops was a good opportunity for me and my sister to have a nose around other bridal shops too! Originally I thought a fishtail shape would suit me as I'm quite tall and curvy but they did nothing for me and I couldn't imagine being able to enjoy the day in such a tight dress. So I tried on some big dresses and absolutely loved them! I really wanted something dramatic and different and the dress I ended up picking was exactly that! To make it even bigger, I ended up wearing another huge tulle skirt underneath for real impact. As the dress was so big, I knew I needed a second dress for the evening - something fun and short so I could dance and not get too hot! We had this dress displayed in our shop and Dave had actually mentioned he really loved the dress when he spotted it on our mannequin. Keeping it secret, I bagged it up that day, telling Dave I had sold it and hid it in the loft knowing it would make the perfect wedding party dress! It was such a great surprise! Why did you choose the venues that you did? We viewed half a dozen ceremony venues in London but Islington Town Hall just ticked all the boxes. I loved the fact the room was circular as it meant everyone felt they had a good view and were close us in the middle. I loved the viewing balcony and could just imagine it being packed with friends and buzzing with excitement. We also loved the decor too with the beautiful domed ceiling, the large windows and the dramatic red carpet. The large staircase was fab for photos and the wide public footpath at the front meant there was plenty of space for guests to stand and throw confetti. When it came to choosing the Reception venue, we had dined at Roast a few times and so booked a table again and went along to envisage what it might be like to hold a wedding there. We were blown away by the beauty of the building in such an iconic setting of Borough Market with the Shard in the backdrop. The food and drinks were out of this world and the staff were so helpful and proffessional. We loved the layout of the space as we wanted a venue without seperate rooms so the guests were all in together - not just girls on the dancefloor and lads propping up the bar. We also wanted a venue that was modern, fresh and beautiful enough to not need to spend loads of money decking it out. Roast ticked all these boxes and didn’t need glitzing up, it’s a beautiful building as it is. We didn’t want to spend loads of money on flowers and room and table decorations - we instead wanted our budget to go on creating a fun day and for it to feel like a great big party. So in terms of decorations, we had a table of ‘Let Love Glow’ glow sticks in glass bowls in the bar area that could be worn as necklaces and bracelets and these got snapped up really quickly! We also had a table with a big silver trunk for cards and gifts along with an illuminated ‘LOVE’ sign, a guest book and some photos of Dave and I as babies and us dating through the years. We also had a few wedding hashtag signs dotted around the venue and a huge ‘Welcome to the Wedding of the new Mr and Mrs Sked’ sign out the front of Roast on an easel, which I loved seeing when we arrived at the venue. We had a huge silver metal trunk full of crazy fancy dress props and I LOVE SKEWIS WEDDING signs- these were all so much fun and made for some hilarious photos. For table favours we had printed sunglasses in bright fluro colours with I LOVE SKEWIS WEDDING 2016 printed on the front which were very Ibiza! For weeks after the wedding we were getting friends and family message us photos of the glasses ‘on tour’… on their kids, on their pets, on holidays- and in some very funny places! It was great to see them getting used post wedding! As a surprise for Dave, I arranged for a Scottish Bagpiper to be playing outside Roast when we all arrived. His family are Scottish and a lot had come down for the wedding so I thought it would be a nice touch! I remember when we pulled up in the taxi to Roast and we could hear the bagpipes from inside the taxi, Dave was saying ‘is that bagpipes I can hear…’ I told him it was and that I’d arranged it for him and his family. He couldn’t believe it- he was so chuffed, he loved it and said it was a beautiful gesture. What were your favourite memories from the whole day? The ceremony was amazing as it had such a good, happy vibe and everyone was just so full of love and happiness for us - we had nearly 150 people at the ceremony and lots of our friends sat on the balcony at the top. When we were announced as husband and wife there was an enormous 'football stadium' cheer and it's just the best feeling ever when you're announced as husband and wife. Another highlight of the day was our entrance to the wedding meal which had been carefully planned with Kit the Saxophonist and DJ Matt. The DJ put on the song by DJ SKT 'Take Me Away', a track that Dave and I love and that always gets everyone up dancing! The lights were dimmed and all the special effects lighting came on to create a real nightclub feel. Literally everyone was on the tables and chairs, wolfwhistling, waving napkins and cheering and the atmosphere was incredible. Dave and I on the coundown of 3, 2, 1 came dancing in and it was just amazing. It was the big climax of the day and I will never forget looking up at everyone just so full of love and happiness for us - it gives me goosebumps just thinking about it! If you could give a piece of advice to any current bride-to-be’s planning their weddings, what would it be? Book a videographer! We very nearly only had a photographer- a friend who recently married talked us into booking one. There is so much of the day you do not see and you forget like the speeches and parts of the ceremony. We will cherish having all of this to watch over and over and show our children in years to come. The photos are equally amazing, but the video shows so much you forget in the whirlwind of the day. Also don’t get too caught up in what you ‘should’ have- we didn’t have a cake as we knew no one would eat it and just didn’t think it was worth the cost.